The Pat O'Brien Cup continued last Sunday in Canton. Kerry defeated the Connemara Gaels in a game that could have gone either way. Galway beat the Wolfe Tones and Armagh-Notre Dame came out well on top against Shannon Blues. The results put Donegal and Galway into a quarter final, while Kerry, Armagh-Notre Dame and Aiden McAnespies are in the semis. The first round of the Pat O'Brien Cup was played last Sunday. I was taking a break in the White Mountains of New Hampshire - so unfortunately I do not have any reports. However, I did get the results. Kerry defeated Cork after extra time, Armagh-Notre Dame beat Mayo by one point, and Aiden McAnespies beat the New England Celtics. McAnespies are though to the semi-final as theirs was a quarter final game. Next Sunday's quarter finals will feature Shannon Blues v Armagh-Notre Dame and the Connemara Gaels v Kerry. Galway will play Wolfe Tones in a first round game that was postponed, and Donegal will have to wait another week to play the winners in the last quarter final game. Conditions were raw in Canton on Saturday afternoon, and after the first half things looked decidedly chilly for the visiting New Yorkers. However, the Big Apple Boys will take some measure of encouragement from the second half display of their charges as they rallied from a five-point deficit to win by four in the end. A goal from Adrian O’Connor 25 minutes into the second half more or less sealed the win. Trailing by a score of 0-6 to 0-1 at half time, New York’s superior fitness told in the second period, while Boston’s lack thereof was apparent. Dan Doona and Johnny Murtagh looked much more comfortable in the forward line, and New York got a big lift from Adrian “The Eagle” O’Connor’s display after he was moved into midfield from full forward. Boston led the visitors by six points to no score as the first half wound down. New York were hardly in the contest. The home side enjoyed most of the possession and outplayed the opposite numbers for most of the first period. Colm McCrory led the charge from center forward, and Boston were full of running coming out of defence. Tony McArdle did well for the home side, as did Neil Donaghy at full back and the New Yorker forwards struggled to find a way through. Any scoring chances generated by New York were wasted as the visitors’ shooting left a lot to be desired. Colm McCrory, Brian Lafferty, and Robbie Croft pointed for Boston. Croft found the mark with some nicely kicked frees. New York’s one and only point of the half came from Johnny Murtagh in the 29th minute, though shortly afterwards Kenny O’Connor should have done better as his cohorts put the visiting side’s best move of the half together. O’Connor swiped awkwardly as a goal chance presented itself, and the ball trickled wide of the posts. Boston's Donal McNulty and New York's Adrian O'Connor contest a kickout. From the start of the second half it was clear that New York intended to turn the tables. The visitors’ play was much more fluid, the passing more purposeful, and Adrian O’Connor lifted his colleagues with his performance from the middle of the field. The breaking balls almost all went the way of the New Yorkers, and fatigue was a telling in the performance of the Boston side. There was more than one stray pass coming out of the Boston defence and several aimless balls were punted into the arms of awaiting defenders. Ken O’Connor started the fightback with two early points on the trot, and Dan Doona capitalized on a wayward Boston pass to reduce the deficit to two points. Doona soon added another and Johnny Murtagh tied the scores with 15 minutes to go. New York continued to press and looked the more likely victors. Murtagh put the visitors ahead with another point, and the corner forward played a part in the decisive score. Kenny O’Connor won Murtagh’s high ball and laid it off to his inrushing brother who slotted the ball low into the corner of the net. Boston tried to lift their game, but tired legs and bodies were the enemy. Kevin Curran salvaged a point from a free, and while Boston pressed for an equalizing goal, the New York defence was equal to the task of preventing one. James Kelly put the final score of the day over the bar for New York. New York will be happy to have gotten a competitive game in before the Connacht championship game, however they will be looking for a much better start if they are to rattle Galway next month. New York: Pa Ryan, Colm McCarron, Brendan McGourty, Lonan Maguire, Ronan Caffrey, Alan Raftery, Aidan Morton, Paul O’Hara, Pat Madden, Ross Donovan, Dan Doona (0-2), Kevin McGeeney, James Monagh, Adrian O’Connor (1-0), Johnny Murtagh (0-3). Subs: Ken O’Connor (0-2), James Kelly (0-1). Boston: Paudie Kenneally, Pat McNicholas, Neil Donaghy, Thomas Maguire, John Lynch, Tony McArdle, Kieran Cox, Donal McNulty, Gary Brilly, Coleman Mulkerrins, Colm McCrory (0-3), Robbie Croft (0-2), Dermot McCrudden, Dan Kenneally, Brian Lafferty (0-1). Subs: Kevin Curran (0-1), Mike Moynihan, Derek Scullane, Julian Leonard. 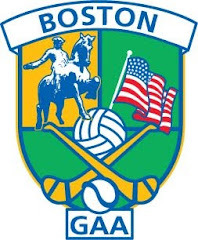 The Boston selection to play New York Saturday afternoon is as follows: Paudie Kenneally, Dan Kenneally, (Christopher's); Kieran Cox, Tom Sally McDonagh, Pat McNicholas, Colman Mulkerrins (Connemara Gaels); Mike Moynihan, Julian Leonard (Cork); Donal McNulty, Kevin Curran, Paddy Kelly, Brian Lafferty, John Lynch, Thomas Maguire (Donegal); Robbie Croft, Thomas Dennehy (Kerry); Michael Carolan (Mayo); Colm McCrory, Neil Donaghy, Tony McClellan, Dermot McCrudden (Aidan McAnespies); Simon Sinnott (Shannon Blues); Marty Farrell, Derek Scullane, Michael Crillie (Wolfe Tones). The 2010 season opens next weekend with the first round of the Pat O'Brien Cup. The draw is as follows: Cork v Kerry, Armagh-Notre Dame v Mayo, and Galway v Wolfe Tones. Saturday night, April 17, at 5:00 a Boston selection will play New York. The boys from the Big Apple are preparing for a Connacht championship encounter with a Galway side that have been making an impression in the National League under manager Joe Kernan.